What is the MELD score? 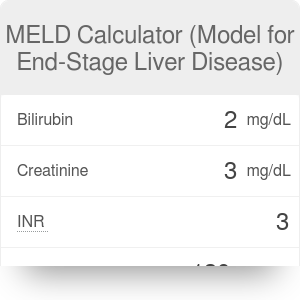 This MELD calculator (model for end-stage liver disease calculator) finds the MELD score to prioritize patients with end-stage liver disease for transplant planning. It is not suitable for children under the age of 12. Keep reading to learn what is the MELD score formula, what lab tests it requires, how to use it and how to interpret it. The Model for End-Stage Liver Disease (MELD) system is used to prioritize patients waiting for a liver transplant. This numerical scale is used for adult patients waiting for a transplant. The MELD score ranges from 1 to 40 (gravely ill). Individual score tells you what is the urgency of undergoing a liver transplant during the next 90 days (three months). If you want to calculate your MELD score, you will need to know some of your blood test results. Make sure that the results are recent. Creatinine: first of all, you need to know your creatinine level in mg/dL. This is an indicator of kidney malfunction and is also required by our GFR calculator. Normal levels of creatinine in blood are approximately 0.6 to 1.2 mg/dL in adult males and 0.5 to 1.1 mg/dL in adult females. If you underwent dialysis twice during the last week, or 24 hours of CVVHD, you should set this value to 4 mg/dL. Bilirubin: it is a yellow pigment that is in everyone’s blood and stool. Normal values of total bilirubin are from 0.3 to 1.0 mg/dL. INR: The INR is a test of blood clotting. The result is given as a number with no units of measurement, as it a ratio of the sample’s Prothrombin Time (PT – a measure of clotting), to the Prothrombin Time of a normal sample of blood. A result of 1.0 up to 1.5, is considered normal. Sodium: the serum sodium test, also referred to as Na+ test, tells you the level of sodium in your blood. This MELD calculator caps the levels of sodium with the lower limit of 125 and upper limit of 137 mEq/L or mmol/L. There are actually two formulas for estimating the MELD score. The original one is still used in non-US transplant societies. The new improved formula was introduced in January 2016 to include the serum sodium level. MELD Calculator (Model for End-Stage Liver Disease) can be embedded on your website to enrich the content you wrote and make it easier for your visitors to understand your message.